Yesterday was the first time in way too long that I was actually able to make the Monday night yoga class at my gym. It's such a nice way to end a Monday, and now that I not only have more time but am able to mentally focus on life outside of the office I really need to get myself back into the routine of going. The only problem with the class is that it is at 6:30pm. I get home at 5:00pm and I don't want to eat dinner ahead of time, but 7:30pm seems a bit late to start cooking and then have to clean up after. We also have a lot of random food in our fridge. Since our schedule was so jumbled last week, I didn't get to do as much cooking as I had planned. So last night I was looking for something really quick that I could throw together in a half an hour or less using only what I had. I took an inventory...a block of tofu, a can of tomatoes and two tubs of spinach that were about to expire. I had a massive craving for Indian food. Tofu palak it was! 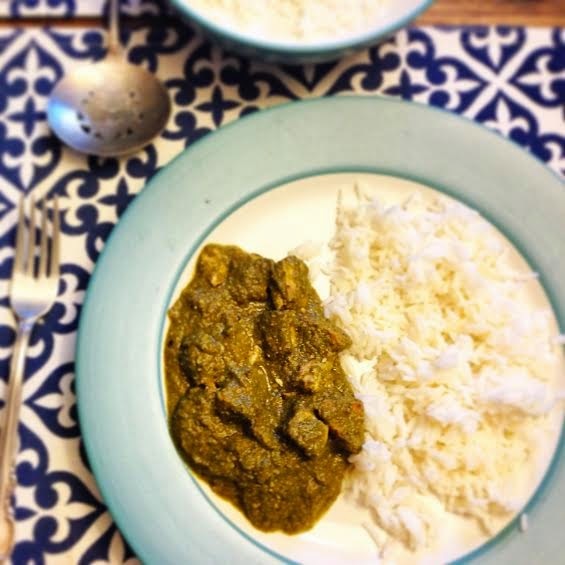 Palak is one of my favorite Indian dishes - there's something about the creaminess of the blended spinach combined with a sweet, spicy flavor that will keep you coming back for more. The tofu is reminiscent of paneer, which is traditionally found in this dish. And, there are no funky, hard to find ingredients in this recipe! This recipe came together in 20 minutes flat, leaving me enough time to clean up and do the dishes before hitting the gym! What a win! 1. Cut the tofu into one inch cubes. Heat oil over medium-high heat and add the tofu and salt. Sautee for about 8-10 minutes, until all sides are browned. 2. Add in the ginger, garam masala, garlic powder and cayenne and sautee for another minute or two. 3. In the meantime, you can make the sauce in the blender. Combine spinach, almond milk, water, cashews, tomaoes, ginger, salt, sugar and garam masala and blend on high speed for about a minute, until very smooth. 4. Pour your sauce over the tofu and lower heat to a simmer for about 10 minutes. Note: I removed the finished product from the heat and let it sit for just over an hour while I was at the gym and the flavors had really had a chance to develop. This is a great make ahead meal and will only get better as it sits. It's that easy! You can serve this with rice or naan - I chose to make it with basmati rice and still had everything done in 20 minutes!